Road closures and traffic detours are usually a major cause for complaint. This is not the case, however, during the Taste of Clarkston, an annual fall festival in Clarkston, Michigan, that showcases local restaurants and caterers and brings in crowds from the entire Township of Independence. Throughout the festival, crews used Collector for ArcGIS to verify and update the event feature service. Entering its twentieth year, the event fills downtown Clarkston with thousands of people who stroll on historic Main Street using prepurchased "taste" tickets to enjoy samples of food from more than 50 restaurants. The Taste of Clarkston grows every year, now drawing more than 4,000 people to enjoy the city's thriving culinary community, along with live music, local exhibitors, and children's activities. It is a boon for local businesses as well, which stay open late to take advantage of the additional foot traffic. Planning the event requires sharp coordination. To put together a smooth, safe, and entertaining day, the two local governments of Clarkston and Independence work with the Clarkston Area Chamber of Commerce and the Oakland County Sheriff's Office. To make this easier, event coordinators recently switched from a paper-based system to a web-based GIS process. And that has made a big difference. Before 2016, all the planning for the Taste of Clarkston was done using hand-drawn maps, written instructions, and spreadsheets. As planning proceeded and changes were inevitably made, figuring out which version of the information was most current and getting that distributed across departments was a huge problem. But at the 2016 Esri User Conference, members of Independence Township's Geospatial Information and Solution Office (GISO) were introduced to Workforce for ArcGIS. They immediately saw the app's potential to assist in planning the next Taste of Clarkston event, which at the time, was only a few months away. The biggest hurdle the GISO had to overcome was that it only had four named users available in its ArcGIS Online organizational account. But at another Esri workshop, a member of Esri's Disaster Response Program mentioned that communities could gain additional temporary users for planned events by going through the Disaster Response Program. So GISO submitted a request and received 30 extra named users for the Taste of Clarkston event. This allowed the GISO to create ArcGIS accounts for all the workers and volunteers who needed one. Independence Township's Geospatial Information and Solution Office created a web-based map app for the public that highlighted the event's sponsors and showcased participating restaurants and local businesses. The first step in the planning process was to digitize the event's vendor and exhibit locations, as well as the event assets. These included the command post, emergency medical services, generators, electrical connections, road barricades, volunteer posts, and music stages. Using Events Site Map (a configuration of Web AppBuilder for ArcGIS in the ArcGIS for Local Government solution), along with input from the primary event coordinators, the GISO digitized the source information, adding additional data—such as vendor tent sizes and available electrical connections—to the attribute table where necessary. The GISO then published feature services related to the event that served as the basis for several map products. To help coordinate the event, the GISO created a Workforce project, which is the ArcGIS Online item type used to provide a common view to everyone involved in a task or event. The GISO incorporated building outlines, parking lot locations, and aerial imagery into the map to provide additional points of reference. Members of the GISO then met with the event's coordinators to determine what Workforce assignment types would be critical during each phase of the festival. The newly created ArcGIS Online users were added as mobile workers as well. During event planning meetings, a member of the GISO introduced crews and volunteers to the mobile app. Using their smartphones, they learned how to accept and complete assignments, as well as how to use the app to gain better insight into the big picture. For the first time, crew members working the Taste of Clarkston received assignments based on their real-time locations. They got a detailed description of each task, its priority, and a deadline, all of which increased their situational awareness. Fieldworkers and volunteers also used the app to report their availability and the status of their assignments to the command post. Workforce helped crews move resources to where they were needed most. And once everything looked ready, the field crew used Collector for ArcGIS to verify the setup and update the data with any last-minute changes. Being able to consolidate data and share information in real time via Workforce for ArcGIS made the 2016 Taste of Clarkston run smoothly. This integrated mobile strategy—with people simply using their mobile phones—boosted efficiency and cut operational costs. The most up-to-date data was always available across all the map products being used for the event. This allowed the GISO to be proactive instead of reactive—so trash got picked up more quickly, shuttles arrived on time, and fire hazards were investigated promptly. What's more, all the setup data was saved and is easily accessible, which will help with planning the festival in future years. Safety and security at the Taste of Clarkston was everyone's number-one priority. The command post, which was set up just off Main Street the morning of the event, included a tent and several tables, with electricity provided by a nearby generator. A member of the GISO opened the Workforce project for the Taste of Clarkston on a ruggedized PC and placed a large second monitor in a central location within the command post. Emergency medical services were located near the command post as well so the paramedics could view the live event map. As vendors made their final preparations, the fire department used the Workforce mobile app to conduct fire safety inspections, while sheriff's deputies used it to maintain situational awareness. Additionally, all the public safety personnel used a common radio channel for communicating about incidents. While most emergencies during the event were minor, using Workforce allowed public safety crews to be better prepared and reduce their response times when situations arose. To further capitalize on its new GIS resources, the GISO also used Web AppBuilder for ArcGIS to create a web-based map app for the public. To increase awareness of the new app, called Taste of Clarkston 2016, links were posted on social media and the township's website. 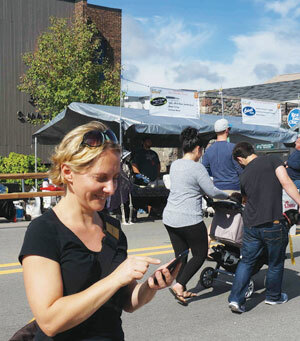 As festivalgoers arrived at the Taste of Clarkston, they could either choose to get a traditional paper map of the event's layout or scan a QR Code to access the app on their smartphones. The Taste of Clarkston draws more than 4,000 people from the surrounding area to sample food from more than 50 restaurants. The app not only showcased the participating restaurants and local businesses, but it also highlighted the event's sponsors in a novel way (by adding their logos to the web app's splash page). App users could see their location on the screen and easily navigate to vendor booths. 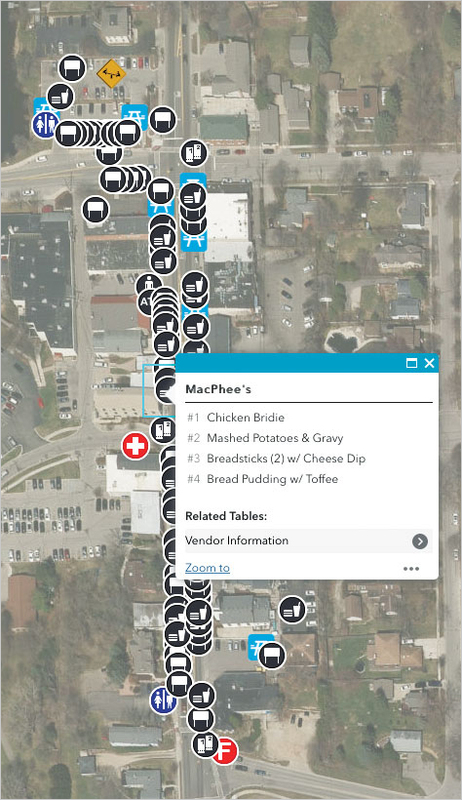 Additionally, by tapping on booth features on the map, users could bring up a description of each vendor along with its menu items. App-using customers were thus more informed and could make their choices about what to taste before getting in line. It is community tradition as well for event goers to vote for their favorite items at the Taste of Clarkston. To streamline this, the GISO is now looking at how to use Survey123 for ArcGIS for the vote during this year's festival. After cleanup, when all the roads were open again, event coordinators declared the 2016 Taste of Clarkston a success. The festival provided residents, township employees, and visitors with a collective experience celebrating what makes the community special. The event's planners and volunteers were enthusiastic about employing new technology in innovative ways. By consolidating data and using the ArcGIS platform's dynamic tools to share information in real time—from the planning stages through teardown—coordinators ensured that the Taste of Clarkston was an entertaining, safe, and smooth event for everyone. Mark Brown is a staff lieutenant and GIS specialist for the Independence Fire Department. Doreen Groth is Independence Township's GIS manager. Brown and Groth are both members of Independence Township's IT Oversight Committee. For more information, contact Independence Township's Geospatial Information and Solution Office (GISO) at 248-625-8222.